Get ultra strong, stay all day hold with TIGI Bed Head Manipulator Matte, a new generation moulder that creates massive texture. Created for those who expect big things from their style, Manipulator Matte helps you to get the most out of your hair thanks to its lifting, gripping and defining polymers. Its beewax format knocks out all artificial shine, making sure that you look is effortlessly matte. Even when the humidity is high, your style will stay in place thanks to synthetic lanolin, which act like tiny micro-sponges to trap water from the hair. Go big, go bold and go strong with Bed Head Manipulator Matte. Work through wet or dry hair and then style as usual. 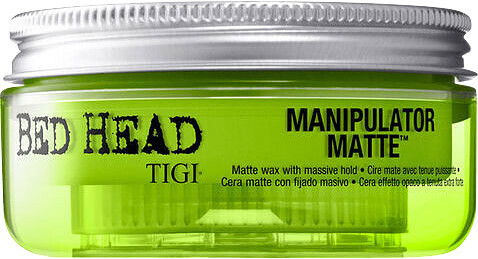 TIGI Bed Head Manipulator Matte 57.5g is rated 1.0 out of 5 by 1.